I’ve decided to include any future reflections on learning on the main page – easier that way! Using the mind-mapping programme, Freemind alongside the critical writing framework from Wallace & Wray (2006) was a really helpful way forward in helping me to organise reading for my literature review. Here is one example of a critical analysis done with these tools. Use the crtl + keyboard function to enlarge the picture if you want to see more detail. (Haven’t worked out how to change the shape of the mindmap so it fits better yet!). Big relief for a very minor achievement – the first draft of my literature review was depatched today for review by my supervisor. It was a tortuous process and I am absolutely sure that my focus isn’t tight enough but will be able to revise it over the coming weeks. I ended up exploring collaborative CPD and communities of practice in more depth than I havd anticipated and am now not sure if it all relates well enough and logically enough to my research aim. Something might have to change. It wouldn’t be the first time! One very good reason for re-reading literature. If there is a disconnect here (and I would obviously have to find out much more about it to say if there was) maybe reflecting around practitioner engagement in research and theory like this might fill a gap. School based educators don’t always know how best to engage with research, and researchers likewise don’t always communicate effectively the relevance of their work to the supposed beneficiaries – practitioners. Such reciprocal engagement is a significant feature of the Teaching Scotland’s Future review. I’m really interested in how this evolves. I feel I’ve made a bit of progress with my literature review this week – done loads of reading and managed to start a schematic organiser on Freemind which is helping me gather and organise my thoughts. Identifying and selecting reading has been challenging. I started of with the focus of collaborative CPD and this has taken me in the direction of Professional Learning Communities, which will be a much bigger theme than I first thought it might be. Reading Louise Stoll, David Trotman, Alma Harris, and Etienne Wenger has given me something to build on in relating their thinking to the practice of Learning Rounds and what I’ve previously written in my research proposal. The best thing this weekend though was a very nice exchange I had with David Jackson at the Innovation Unit who has shared lots of his articles and writing on moving beyond PLCs to learning networks – really interesting and relevant. I’m looking forward to exploring these during the week. There are difficult to reference though – some aren’t published but he is happy for me to use them. I guess this is the “personal communication” category – deciding how ti reference them is quite a high class problem really, I suppose! Google+ – interesting educator conversations going on there. I should really include some excerpts here. This link will have to do for the moment. I’m really disappointed in TESS (and TES) these days – I rarely find interesting articles to comment on. Last week was a bit of an exception with the report on the Stirling University research. It seems that sort of stuff is few and far between these days. I gave up buying it a while ago for different reasons, but it even seems rarely worth the trouble to look up the online version now, but I dutifully do each Friday. As an avid proponent of online communication, I understand the difficulties facing the printed media in our times, and to a point I acknowledge their attempts to stave off their irrelevance and – lets face it – perhaps even impending obselesence , but can’t help thinking that it’s looking a bit like fingers in the dam time. The information I gather from blogs, wikis and twitter is much more valuable to me for many reasons. Firstly it’s instant, it’s fast moving and I can access it at the time and in the manner of my choosing. Secondly, I can engage with it, discuss it, respond to it and have conversations round about it which I can see documented in front of me. Thirdly, it’s free to me. Fourthly a lot of it comes from expert practitioners in my field who really understand the issues, not journalists. Finally, it’s just the way things are . See Stephen Heppell below. Thank goodness for Twitter – once again it has helped me out – this time to get started on my literature review and given me a few good ideas for planning. The inspiration this time came from Ian Guest, a practitioner in Sheffeld, whom I’ve been following for a wee while (and he, me). Ian has just really submitted his Master’s dissertation and successfully completed his studies. It’s a good one; on pupil perceptions of learning. What has really inspired me though, and this isn’t the first time either, is that Ian has set up a wiki for interested practitioners who are involved in extended studies (i.e at master’s level or beyond) to share their progress. So far a handful of people have added themselves, Ian is by far the most active. 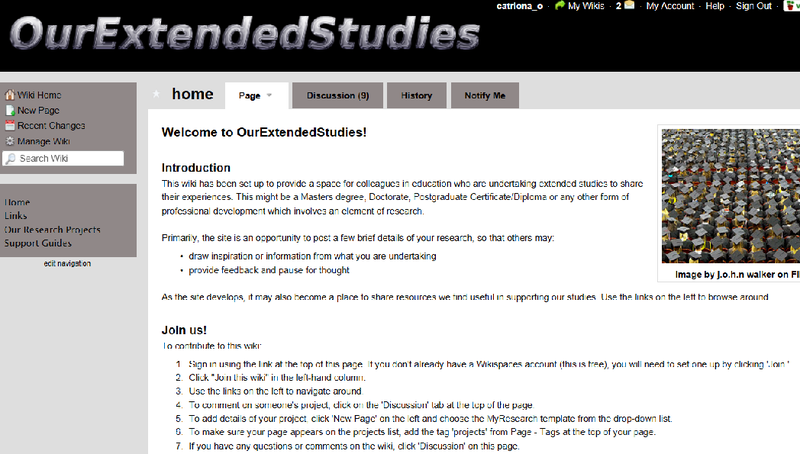 I’ve shared my assignments so far on the wiki and a few poeple are interested in my area of study. I tend to use it when the pressure is on and I’m looking for something, because I know I’ll find the answer there, and if i don’t someone will help me. I’ve never met Ian but he’s been a huge help to me, and I am very impressed by his work. The wiki is a really great example of how online tools can support learning, develop collegiality and share practice and ideas. Hats off to Ian for setting it up. I wish more educators worked this way. If you’d like to have a closer look at Ian’s research you can find it here, and I would warmly recommend that you do! More from the aforementioned Stephen Heppell – what a guy! -expanding a bit on his rule of 3 and putting a fairly compelling case for leaving behind the structures and structures of our present system in order to meet the needs of 21st century learners. …engagement, seduction, astonishment, passion, delight …..of a new learning world. If we don’t do it, kids willl go somehwere else. They have choices. So do we as educators. We can choose to respond or we can do what we’ve always done. And as Stephen Heppell says – make a jolly good job of preparing young people for life in 1973. Here is very interesting article about research by Gert Biesta and Mark Priestley of Stirling University. While teachers are supposed to embrace a less prescriptive way of working, they still expect to be judged on exam results. Fundamental change is being demanded of them without the necessary transformation in structures and culture. Looking beyond local contexts and thinking about tranformation in structures and culture, I was reminded of Seth Godin’s blog post Back to the (wrong) school where he challenges the industrial model of schooling as being two centuries out of date and far from fit for purpose in our times. Sir Ken Robinson has also spoken about the inadequacy of our present outdated factory model of education which by design, depersonalises and alienates its client group, i.e young people. I know he is involved in The Portland Academy which is the only truly paradigm-shifting model for schooling I’ve come across on these shores – if you know of any others add a comment and I’ll check it out. To get back to the article though, the statement about over – emphasis on teacher agency isn’t surprising given the context, but it was the comments on professional development which interested me most. Questioning the discourse of a professional development that puts “all the burden on teachers” is maybe a necessary thing to do, but the PRD process has a role to play here, in negotiating professional learning by aligning personal/professional; departmental; school and national priorities in a CPD plan which evolves out of a professional discussion and feeds back into a professional learning continuum? And why is professional dvelopment a burden anyway? I must try and seek out the paper this work originates from. A footnote on assessment: all but 6 local authorities in Scotland have reverted to using standardised tests in primary, apparently. I’m not sure that you can say you are embracing CfE and the principles of CfE design and do this at the same time?. A brave group of the remaining 6 has established itself and will collaborate to develop CFE learning driven assessment. Could this be a turning point for CfE? Let’s hope they are supported in structures and cultures which nurture innovative thinking – could there be a new paradigm for assessment in this? For example, Bowers makes sweeping generalizations that are probably wrong – “Generally overlooked in the worldwide effort to promote the Western model of development is that one of the primary driving forces is the further automation of the process of production” – um, I mean, what? And he argues against people by pointing out what they don’t say, rather than identifying what they do say, and engaging them on that. Perhaps before saying “[Dewey’s] silences and misconceptions [include] his failure to recognize the world’s culturally diverse knowledge systems…” it may make more sense to describe and discuss what he does say about cultural pluralism (which is a lot). Thinking, Learning and Beyond (facts). This is one of the most powerful blogposts I’ve read in a while – an amazing account of a deep and rich learning journey – sit back and enjoy! There seem to be so many innovations going on in England they have totally obscured what is happening in Scotland (See the map below). The work of the Innovations Unit is really exciting -some staff attended our summer school last year and really challenged local authority representatives to think radically and innovatively about their practice -it wasn’t easy and it wasn’t always comfortable, but it had a big impact on my professional learning. More recently at the STEC conference in Stirling we had a chance to investigate what was going on in this area in terms of school-university partnerships, collaborations in research, which as we all know is one of the recommendations in the Donaldson report on Teaching Scotland’s Future. There were lots of interesting workshops which demonstrated this in action, and there are obviously some great examples of university researchers working together with school staff to move forward curriculum change ( Mark Priestley from Stirling and Highland Council have a CfE project going on) and use schools as sites of reseach to help empower pupil voice through enterprise and citizenship projects (Ross Deuchar from UWS and E-Dunbartonshire, for example). What to me seemed to be missing was a strategic approach to this; a gap that the Innovation Unit seems to fill. My colleagues have been talking to the TDA in Manchester this week, one of the subjects for discussion was the different approaches to school/university partnerships in England. I’m looking forward to hearing about what they had to say. It’s going to be late. I needed to get an extension because of a few extra things going on that I hadn’t really been able to anticipate. So here I am trying to write my RP and delving into fascinating articles, gathering them up, trying to work out which are most relevant, and so on. A reference in one of them steered me in the direction of the AERS project. That’s a good idea, I thought, so I went about trying to find the article. I copied the URL – page not found. 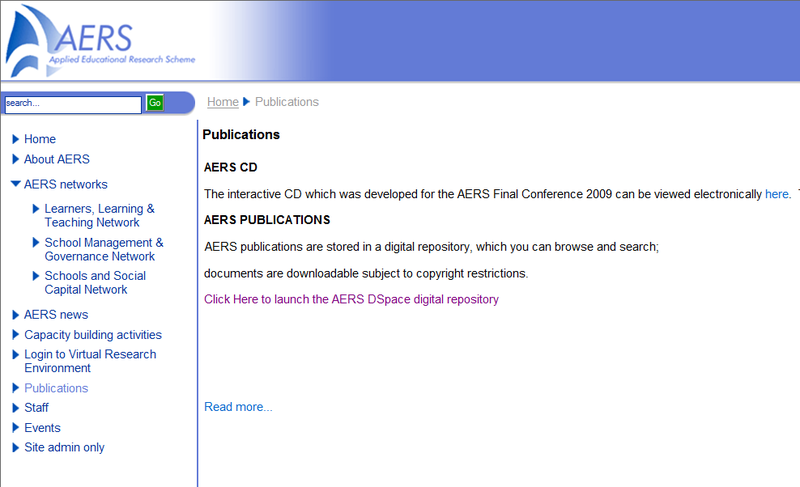 Undeterred, I searched for AERS and found a website. Great, I thought – there will be loads of stuff here, I actually know a few of these people and recognise most of the names. But unless I am mistaken, or banned from accessing this material, it turns out that there is not much there at all. The website tells you very nicely how the project was organised but there doesn’t seem to be any evidence of the research carried out. The Applied Educational Research Scheme (AERS) is a two million pound, 5-year programme funded by the Scottish Executive Education Department and the Scottish Education Funding Council, which started in early 2004. AERS aims to enhance educational research capability in Scottish Higher Eduction (yes-really, not my mistake) Institutions (HEIs), and to use that capability to conduct high-quality research which will benefit school education in Scotland. Well thanks for letting me know, but how on earth is this going to benefit anyone if it isn’t shared openly and if the supposed beneficiaries, school educators in Scotland, can’t access it? I had to put out an SOS for information from my PLN on twitter to eventually get a link to an AERS-funded article that was published in ESCalate. 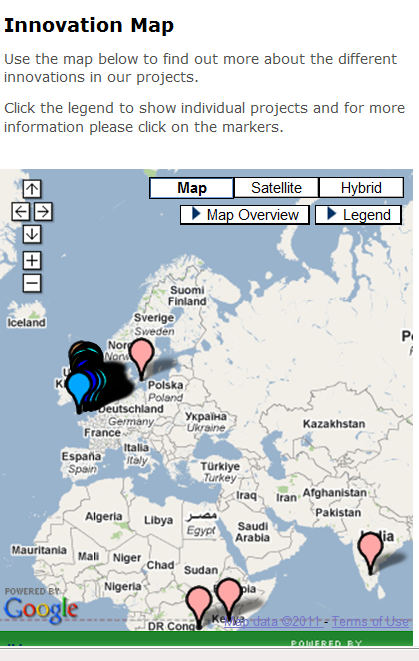 Good old PLN – it never lets me down. Public money paid for this. Simple question is why is now being treated like private property? I’ve blogged about setting/mixed ability before, but I’m a bit exercised about it again because of a discussion in M.Ed class yesterday about job satisfaction. Our tutor ( he’s really been fab – helpful, supportive, encouraging) was telling us about a project he’s researching involving technology and a group of high achieving students in a low achieving school. The group of pupils have been identified as high achieving and in any other school might have a fair chance of accessing higher education, but chances of them achieving this in the circumstances they live and work in are slim, by his accounts, but if any of them will, they will. It sounded like a really interesting project but I felt a bit uncomfortable with it on a few counts. 1. They were identified by their school as high achieving through some sort of setting arrangement that presumably was put in place in S2 and based on exam data. Is this maybe a bit early to make these assumptions? 2. From what I understood, they were encouraged as a group to remain cohesive, and it seems that once formed, the group was fairly stable: core membership remained the same. 3. Certain privileges were made available to this group – i.e devices necessary for the research; access to tutor/mentors to help them increase their cultural capital – one of the many areas they were disadvantaged in for HE access. So I’ve been wrestling with a few issues since this discussion. Is class test data in S2(or whenever it was) reliable enough to determine who might be in this group? Is it not a bit arbitrary to decide this on setting data, and is there any evidence to suggest that setting actually gives reliable information about ability? Is that a bit early to write many others out of a HE future? There is an element of social engineering about this which worries me. I have never been in favour of setting,. This project, as described, although valuable in in highlighting the barriers, hidden or visible, that many deserving students may face when trying to access to HE, seems to amplify the very divide that their education should be attempting to overcome. But the most unsavoury element of all this for me is using the evidence for setting at S2 as an indicator of future achievement -to me this suggests limited expectations, little room for manoeuvre, and a decidedly fixed ( not growth) mindset. I wonder if they know about Dweck? I think they might learn a bit from her, and I’d be interested to know what they make of her insights. As usual , an excellent thought-piece from John. How can we expect teachers to develop independent thinking in learners when the opportunity to do so themselves is often denied or subverted? I’ll need to read the Donaldson Report in greater detail, but I wonder if this issue is touched upon in it. For future reading now that assignment is out the way (for the time being). 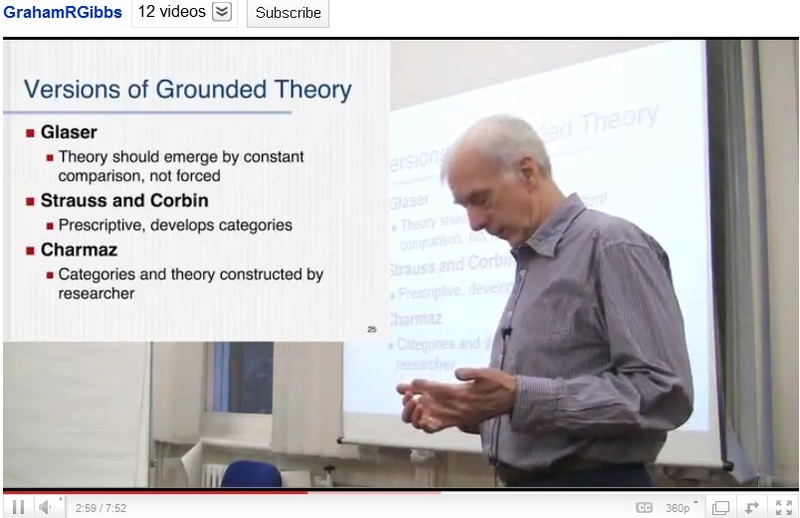 Grounded theory on youtube – yes, really! I came across this youtube video, and added it (of course) to my delicious collection. It shows a lecture from Graham Gibbs on Grounded Theory. It’s part of a series. It’s great to watch because it really brings it all alive for me. He’s not particularily passionate about it and he doesn’t take a hugely different approach from our own lecturers but it’s always good to hear someone else’s take on something and the videos are really good, accessible and informative. Most importantly, he took the trouble to share them in the widest possible way – I wish there were more like this. Well this is really fascinating – he seems to take data and create visualisations out of them. Very clever – and novel, and I like the openess of his approach, inviting readers to join in a constructivist way to add to what he starts on. He’s an author as well. I wonder what he would make of the PISA stats……. There is a serious backlash to previously published research going on at the moment in the shape of the vendetta against Dr Andrew Wakefield, who originally published the results of a study which claimed to link MMR vaccine to the onset of autism in young children. There are loads of claimed inconsistencies in his research, which was allegedy carried out among a very small field of cases, and has been contaminated by a link with legal and financial issues. Without going into too much detail here, two questions occur to me. 1. If the research was so flawed, why was it published in the first place? What is the role of peer review or quality assurance in the Lancet? 2. What does the “official “research about the safety of the MMR actually say? How was that research carried out? This worries me slightly, because thinking in probability terms, can a “treatment” or intervention be universally applied across the population and induce the same ( assuming “safe”) reaction in every single person? Is everyone going to react to the intervention in the same way? I don’t think so. I still don’t think we have bottomed-out on this one. I am struggling with this RM assignment – half way through now. It hasn’t been the best module we’ve tackled so far in M.Ed and I am labouring my way through terminology that I’m still not clear about. Well, clear enough about the words, but still not sure how they relate to each other. For example – paradigm, perspective, theoretical lens and approach. Do these all mean the same thing in research terms? Creswell uses paradigm and perspective interchangeably. Qualitative/quantitative – is this the paradigm/perspective or approach? I need to do some reading to help me critically assess policy, management and governance of education. I have a list of books and papers: Fullan; Bryce; Brookfield and Hume are top of my list but if you have any books, articles or journals you could suggest please let me know here. Thanks so much to the wonderful generosity of spirit I have come to love and enjoy from my Twitter community – I know you’ll be the ones to help! How about this really good blogpost from Margaret Alcorn of the National CPD team? Policy is self serving; practice informs teacher beliefs rather than the other way round? Ellmore suggests that we are more likely to be influenced by our past practice than by our beliefs. This really supports the “comfort zone ” idea – where we persuade ourselves that what we do is “good teaching” and it can be moulded or interpreted into something that meets criteria for a new set of values. It’s the ” I’m doing it already” stance – something we are sometimes encouraged to to believe by HMIE, for example. You can see why. Radical overhaul and rethinking are threatening. Text books have often been invested in which can’t readily be replaced. But change still needs to happen. And it happens in education when teachers start doing things differently ( Fullan). There is an easy way. The easy way is persuading yourself you’re doing it anyway. That’s how we end up with the “I am a global citizen because I eat pizza” scenario. And with re-labelled worksheets. This is the ritualistic attitude ( Brain et al). Bring on the innovators! This article by Don Ledingham really stuck a chord with me. So often I hear teachers say thing like “the powers that be have decided…” “we’ll get our orders from on high…” and the insidious hierarchy evident when teachers talk about moving “up” to secondary school is also part of the great line of power. So where is point zero of the structure? Where does this line start? Government? Policy? Policy architects? God?! Following this stucture through to its logical conclusion, the line descends through local authorities (cascading through the various tiers of management there) onto school senior management, then school middle management, then teachers, then eventually pupils. And there it stops. There is the bottom of the heap. Will CfE change this – it claims to put the child at the centre. Viewed through this perspective, that means totally reversing a mindset. I wish I shared a bit more of Don Ledingham’s optimism that this will happen. I often meet teachers who say that’s lovely but can you just give me the stuff please. Or- great but please just show me the assessments. Of course I also meet many innovative teachers in the Brain/Reid/Boyes definition, who accept the policy and reject the practice so that they can innovate – true policy mediators. Does CfE give us the scope to truly innovate? Yes I believe it does. Will the ” biggest educational reform for a generation” empower teachers and really bring about meaningful change? I hope so. Time will tell. This idea really reminds me of a way of working I came across in America, at the Options Institute. Everyone in a learning round is a volunteer -teachers work in triads and observe each other teaching . The feedback is non judgemental and the discussion focuses on what everyone involved can learn from the observation experience, not only the observed teacher. It makes sense; CfE makes a big deal about collaborative working for pupils – this is colleagiate and collaborative working for teachers – giving them a reason and a space to engage in professional dialogue. What’s not to like? I will reflect on the two posts above in the coming week, but I just want to get down on paper (?) a few reflections I’ve had since reading Stephen Brookfield’s Becoming a Critically Reflective Teacher. The chapter on using our own autobiographies as learners had some powerful messages in it. He describes how it feels to be asked for an answer from a teacher/learning leader ( he was at a conference), offer a response with the usual hands up signal, then get ignored. Thi is not a new problem or dilemma to be faced and analysed at classroom level, but it does merit comment. Hierarchies can very quickly develop where confident individuals (my least favourite of the four capacities by a country mile) who think quickly (tortoise minds tend not to be in the running! cf Guy Claxton), fill a space engineered by the learning leader, who, lets face it is grateful for any contribution to his/her conversation and thus embarassing silences are avoided. But sometimes this can exclude people who think more deeply/slowly/feel uncomfortable speaking out in public, and a feeling of exclusion can develop. His own reflections on the experience lead him to try to engineer more inclusive questioning techniques in his own classes, but the ideas rang out Carol Craig’s work very loudly in my ears. Why is our benchmark of confidence so bound up with the singular notion of public speaking? I am facing the very uncomfortable question here of ; is this a wierdly British class issue? I just wonder if aspiring to be able to debate is still at the root of this peculiar notion. “Presentation skills” are highly valued in CfE. En plus, (if anyone can give me a better English equivalent than “moreover” – urgh- please let me know. Brain not working at its best right now) is there an underlying assumption in schools that the pupils who speak out first or loudest are more able? That sounds like a really uninformed statement, but I have a nagging suspicion about this. Which I won’t go into now. Confidence can manifest itself in many ways, and like Dweck, Brookfleld comes to value effort and persistence over confidence. Thinking about appointing staff, he concludes that he will pick out those who appear to have improved over time rather than those whose achievements were excellent from the start, as the former gave an indication of willingness to learn and hard work. In other words, the quality we know as Grafting. I wish that was one of the four capacities. The way he describes his attempts to learn to swim is very funny, but equally enlightening. Having been shown by an expert, youthful, muscle-bound instructor how to dive in one end of the pool and emerge at the other in a matter of seconds, he describes how crushingly inadequate he feels. That made me think about my own teaching. Do I do the same when I start off my lessons in French? ( But my muscle tone is a bit pathetic I might add here) I’ve lived there for a number of years, visit regularily (at least twice yearly) and have no reason to worry about my fluency as a teacher. But how does that make my learners feel? I need to do more reflecting on this. The really interesting thing about his swimming lessons was that the breakthrough was made for him when a fellow learner lended him some goggles. Now, as a metaphor for classroom learning, that speaks volumes. We need to get good at peer learning, at empowering learners in the classroom through meaningful collaborative practice, self assessment and peer assessment and make it part of our teaching culture. In languages, this seems to be ridden with difficulties. I exchange regularily with enlightened colleagues who understand this, but I spent this afternoon rehearsing with my daughter the script for her “role play” which is to be an assessable part of her standard grade speaking test. She had to script it out and get it corrected by her teacher. It’s just not good enough. She is drowning in rehearsals for scenarios which will NEVER take place, and can only really “rehearse” work that her teacher has approved and signed off as acceptable. This practice is really pretty inexcusable and has no pedagogical validity whatsoever. There is nothing more to the exercise than remembering; there is very little relevance, challenge and absolutely no engagement on the learner’s part. So motivation dwindles and she sees it for what it is – a sterile, pointless exercise that needs to be “got through,” for exam purposes. My next reflective piece is going to be about policy in Finland where every teacher is educated to Master’s level and has an involvement in action research. Would this happen in Finland I wonder?